“Only one in three Armenians supports Armenia’s fence-mending agreements with Turkey and the possible opening of the border between the two estranged nations, according to an opinion poll released on Monday,” RFE/RL reports. Following Turkish President Abdulla Gull’s historic visit to Armenia, Armenian bloggers are engaged in active discussions – was it a positive step, or a negative one? Was it right for Armenia’s to invite highest Turkish official to Armenia or not? Even the fact Armenian football team lost 0:2 to Turkey, has been completely overshadowed by Turkish president’s visit. There is also an interview with Latvian blogger Artur Mednis. Download the full podcast here or listen to it online below. Unzipped has an exciting post about the surprise win of the Armenian national youth team (European Championship Qualifying Stage of the Under 21 Championship) over Turkey. 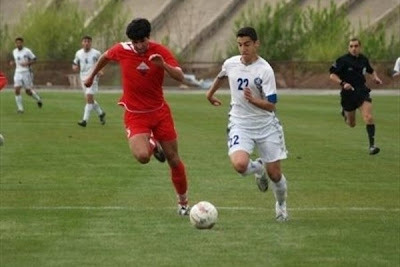 Although the game was not that significant and the youth teams are rarely considered important, the fact that the game took place between these two countries which lack diplomatic relations since Turkey closed the Armenian border in 1993 is seen an important first step, to be followed by a game between the national teams of Armenia and Turkey on September 6th. Although the chances of the Armenian team to win on the September 6 match are rather slim, the win of the youth team has inspired Armenian football fans with renewed confidence. The game is very promising from a diplomatic perspective as well. Armenian president Serge Sargsian had invited the Turkish president Abdullah Gul to visit Yerevan and watch the game in July. Abdullah Gul has been postponing his decision about accepting or rejecting the invitation. Possible protests in Armenia against Turkish President’s visits are among the reasons for Gul’s hesitation and ARF-Dashnaktsutyun have said they’ll definately stage actions in Yerevan. At any rate, thousands of Turkish fans are also expected to arrive in Yerevan for the match and the Armenian authorities have already promised to slash visa fees for them. According to some Armenian media reports the Turkish fans have applied to their government asking them to open the Turkey-Armenian border for one day, so they could use the Kars-Gyumri railway to arrive in Armenia and cheer for their team. If true, this might become another significant development in establishing relations between the two neighboring countries.